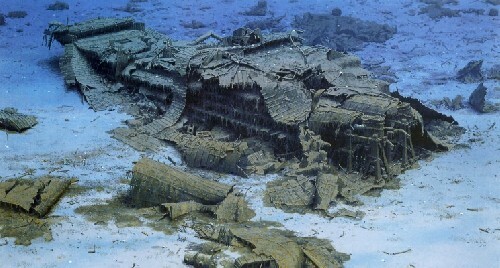 ok the titanic do to it being under the cold north atlantic for 95 if rasied would decompose!!!!! but if there were a dome that kept it in water that went over it very slowly rase it with out it touch air! its crazy but with scientist help it just might work! and no. it couldn't be done. there is to much wreckage spread out for a miles. also the sudden change in pressure and the movement as it comes up will collapse it.And when the dome opens at the surface, it could collapse at anytime. P.S. Did you know there is only 1 titanic survivor left? shes 96. the 2nd died in october. Why are the memorial plaques placed on the bridge? Titanic's passengers and crew were gathered on the stern of the ship before she sank. Why not put the plaques there? I realize the deck is peeled back, but you could (in theory) put the plaque on the underside (now the topside) part of the deck. This was where most of the people where at the end. They should have a plaque in their honor. rip1912 wrote: Here's a question for you. I agree with you. That was the last place of refuge before their voyage to eternity. Didn't Ballard lay one of his plaques on one of the stern's capstans? The one that was left for Eva Hart's father, and later on was found to have either been moved or stolen from where he left it? THS Plaque Honoring the Dead is missing! In 1986 a bronze plaque created by the Titanic Historical Society was placed on the stern of Titanic by the manned submersible Alvin on Robert D. BallardÃ¢â‚¬â„¢s second expedition to her grave. The first expedition was a cooperative effort of American and French scientists who discovered Titanic on September 1, 1985. The plaque was the first tangible remembrance placed on the wreck and originally was to be left on her nobly preserved bow, but the majority who died had gathered on her stern, and that last, final haven was chosen. The plaque reads: "In memory of those souls who perished with the "Titanic" April 14/15, 1912. Dedicated to William H. Tantum, IV whose dream to find "Titanic" has been realized by Dr. Robert D. Ballard. The officers and members of the Titanic Historical Society inc. 1986"
When you see the movie "Ghosts of the Abyss" you should note that the THS plaque is missing - maliciously removed. An act no different than that of vandals who get their kicks by turning over headstones in a cemetery. Instead you will see a host of other plaques left there since THSÃ¢â‚¬â„¢s first placement of a memorial plaque. Bill Tantum was a former president of the THS who worked with Dr. Ballard in the 1970s to find the ship. Ã¢â‚¬Å“Bill kept my Titanic dream afloatÃ¢â‚¬Â� said Ballard who wanted the plaque to be a tribute to Tantum and the Titanic Historical Society who were the first to keep the memory of the ship alive. We hope you will share our pride in the contributions the Titanic Historical Society, Inc. has made since 1963 to preserve the history of Titanic and to help in her discovery. Since 1985, we have cooperated with governments and institutions to protect the wreck and educate the public to recognize that Titanic is a grave site and should not be plundered. Well, I guess you have read about the whole controvercy involving the release of Titanic's discovery in 1985 right? Ballards Team and Jean Louis Micheall's team were supposed to release the footage and story at the same time. But somehow ( I cant remember the whole series of events) Ballard's side came out first and "stole" if you will, the fame and glory. I'm sure for years afterword there was much hard feelings from Ifremehr. The Stern looks worse than the bow because air was trapped in it. When Titanic broke in half, air in the bow rushed out of the break. The stern (because it was vertical) held onto the air, until (maybe) a few hundred feet down when the water pressure caused it to implode- destroying the structure.